In this article we will tackle the problems of getting an accurate diagnosis and appropriate treatment options for Femoroacetabular Impingement (FAI). We will also present discussions that a problem of pain and function of Femoroacetabular Impingement can be addressed with treatments that focus on the soft tissue of the hip and low back. We will also focus on treatments that would help prevent bone spurs from developing in the ball and socket hip joint. Femoroacetabular Impingement or sometimes diagnosed simply as Hip Impingement is a condition where abnormal contact and rubbing of the ball and socket portion of the hip bones creates joint damaging friction. For some people, the rapid degeneration of the hip joint causes the formation of bone spurs. The bone spurs are there because the body is trying to create stability in a joint that has become unstable. The loss of stability can be traced to a weakening of the ligaments and tendons of the hip, low back, groin and hamstring areas, and hip labrum degeneration. In the minds of some athletes / runners, the bone spur formation at the ball and socket of the hip are the big problem. These runners think the best way to treat bone spur formation is with a surgery to shave them off. But is that the best way? Or is it the best way for everyone? For many athletes / runners, surgery is a concern. Rather than have the surgery, some patients will manage themselves along as best they can, for as long as they can with the help of painkillers and anti-inflammatories. Most of these people will continue to exercise or run through dull constant pain. For some patients we see, running has now become difficult at best for them. Even as they admit to an accelerated use of over the counter anti-inflammatories. These patients tell us that nowadays his/her run will usually end when the pain become too much to handle and running turned into limping. These patients are reaching the end of their ability to self-manage. These people see surgery as the only way. They are in our clinics as possibly the last stop in an attempt to find non-surgical relief. There are times when femoroacetabular impingement surgery may be needed. There are other times when femoroacetabular impingement surgery may be THOUGHT to be needed. But can probably be avoided. There are times when non-surgical consideration should be given top consideration. In pincer femoroacetabular impingement, when the hip is in full flexion (as in pulling your knee to the chest), the femoral head-neck junction hits the anterosuperior aspect (the front of the acetabulum). This problem is commonly caused by the socket being “too deep,” and the ball will pinch structures like the labrum between the acetabulum and the femur neck, this problem is also diagnosed as coxa profunda or protrusion acetabuli (where the ball of the hip protrudes into the pelvic area). In cam femoroacetabular impingement, there is abnormal contact between the head and socket of the hip because of a loss of roundness of the femoral head. Cam comes from the Dutch word meaning “cog.” This loss of roundness causes an abnormal contact between the head and the socket of the hip. 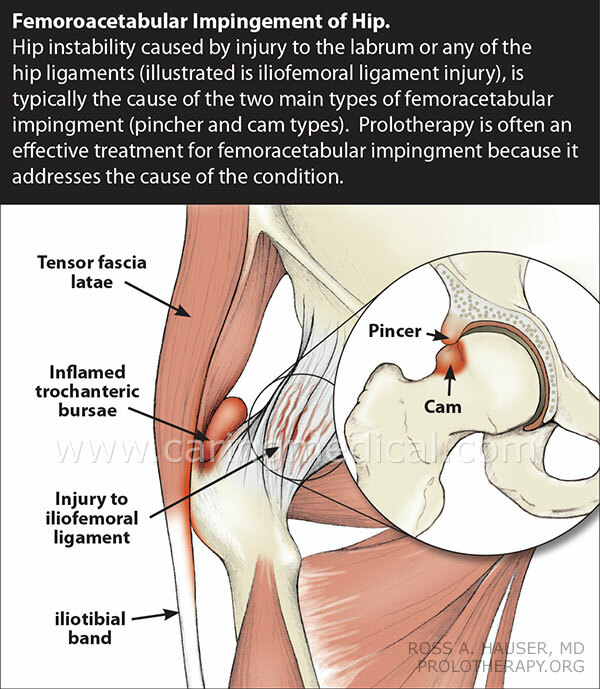 In cam FAI, the impingement typically occurs when the hip is flexed, but also internally rotated. As already mentioned, patients often have “mixed” FAI, meaning they have a combination of both. This next section of our article will deal with the surgical challenges of femoroacetabular impingement. As we do in all our articles, when surgery is discussed, we bring in the opinions of some of the world’s leading surgical researchers. In the medical journal Osteoarthritis and Cartilage (1) doctors found: “The optimal therapy for femoroacetabular impingement is unclear,” in trying to prove out the surgical options available to patients. The doctors noted in their research of 18 studies comparing management strategies – none of these studies compared surgical and non-surgical treatment. The number of arthroscopic surgical procedures for patients with femoroacetabular impingement syndrome has significantly increased worldwide, but high-quality evidence of the effect of such interventions is lacking. The primary objective will be to determine the efficacy of hip arthroscopic procedures compared to sham surgery on patient-reported outcomes for patients with femoroacetabular impingement syndrome. The secondary objective will be to evaluate prognostic factors for long-term outcome after arthroscopic surgical interventions in these patients. Despite femoroacetabular impingement being a problem of many factors, surgical management to correct bone abnormality has been the predominating focus. However, the high prevalence of bone abnormality findings in asymptomatic, pain-free individuals suggests the problem is more complex. The patient cases of this study illustrate the clinical reasoning process (customized therapy based on the patient’s goals and need of treatment) utilized to prioritize subjects’ treatment along with a continuum of neuromuscular control (training the muscles to help provide stability in the hip) and mobility. The treatment approach also illustrates successful management of potential surgical candidates that elected to forego surgery after satisfactory completion of conservative management. Brief note: We work with physical therapists, especially in patients that do not respond to physical therapy to help them respond to the treatment. Please see our article Why physical therapy and exercise did not restore muscle strength in hip osteoarthritis patients, this will show how strengthening tendons and ligaments provide the resistance necessary in some patients to maximize the benefits of the PT. To take this line of thinking one step further, that strengthened connective tissue in the hip could provide counterbalance in asymptomatic FAI patients, let’s look at a study (Juy 2018) in the Orthopaedic journal of sports medicine (4) Here researchers looked at patients with femoroacetabular deformity (FAD) who do not experience pain. The FAD group was significantly stronger than the FAI (patients with pain) and control groups during hip extension, and the femoroacetabular deformity group had greater sagittal (left / right) pelvic range of motion and could squat to a greater depth than the FAI group. The stronger hip extensors (the muscles Gluteus maximus, Biceps femoris, Semitendinosus, Semimembranosus) of the femoroacetabular deformity are associated with greater pelvic range of motion, allowing for greater posterior pelvic tilt, possibly reducing the risk of impingement while performing the squat, and resulting in a greater squat depth compared with those with symptomatic FAI. Conclusion: Improving hip extensor strength and pelvic mobility may positively affect symptoms for patients with FAI. In September 2018, an interesting case history was presented in the Open access journal of sports medicine. (5) In this study, a young female athlete helped demonstrate successful management of symptomatic bilateral femoroacetabular impingement syndrome. She had surgery on one side and non-surgical treatment on the other side. What did the researchers find? They could not really tell. 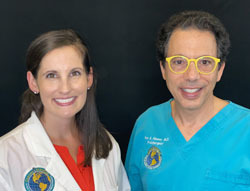 “The strengths of the presented case report are the opportunity to compare surgical treatment and non-surgical treatment in the same patient, as well as a long follow-up period for the surgically treated hip and the use of PROM (patient reported outcome questioning) validated for use in a young and active population. The limitations in the present case report are the lack of pre-treatment PROM data for both hips, which limits the opportunity to draw any firm conclusions about the baseline condition and amount of improvement. The different alpha angles ( a way to measure hip dysplasia, the abnormal placement of ball in relationship to socket) for the two hips, 60° for the surgically treated side and 50° for the non-surgically treated side, also limit the opportunity for comparison. NOTE the non-surgically treated hip dysplasia is more severe. No gait analysis was performed and it is, therefore, possible that the patient was unloading one hip, generating a false favorable result for the other hip. It is worth mentioning that both treatment regimens included physiotherapy, but the postoperative physiotherapy was mainly aimed at gradually increasing the load on the hip, while the physiotherapy for the non-surgically treated hip was aimed at strengthening and stabilizing the hip girdle in pain-free range-of-motion. The bottom line factor here is that it was, in fact, difficult to compare surgery to physical therapy even in the same person for numerous reasons. One is, the similar lack of success of the treatments was influenced by the fact the female athlete reduced her activity level. Lastly, the patient was a 31-year-old physiotherapist. Is it Femoroacetabular impingement causing your issues or is it something else? People with femoroacetabular impingement can have no symptoms at all. So what could be the underlying cause of your hip pain? Is your MRI showing you what is causing your problems? In a study in the journal Clinical Orthopaedics and Related Research (7) Japanese doctors followed up with their findings that because FAI is seen on MRI in many symptom-free patients, doctors should question the need for femoroacetabular impingement surgery to correct a problem that does not seem to plague the patient. Is it Femoroacetabular impingement causing your issues or do you have hip tendinopathy and Greater trochanteric pain syndrome? As we have mentioned many times in our hip pain related articles, the hip is a big joint, we believe to help patients achieve their treatment goals, the entire hip needs to be examined with recommendations for treating the whole hip joint. We discuss this further in our article: The evidence for Prolotherapy as a hip-preserving alternative to arthroscopy and hip replacement. Recently in our article on greater trochanter pain syndrome, an example of the problems in getting successful treatment is found in treatment failures were concentrating on specific hip problems instead of treating the whole hip joint shows why some hip procedures did not work as well as they should have. The example we cited is a new paper from doctors in Italy who looked to see what caused greater trochanter pain syndrome in patients with suspected femoroacetabular impingement syndrome. After magnetic resonance arthrography of the hip and evaluation of 189 patients, in the end, it was hard to say why patients with suspected femoroacetabular impingement syndrome also suffered from greater trochanter pain syndrome. Why? Because the biggest problem 38% of the patients had tendinopathy of the hip, 16% had bursitis. Problems considered “normal hip pathology.” So there were many problems causing the patient’s discomfort, simply treating one problem or the other was not going to help patients in the long run. Is it Femoroacetabular impingement causing your issues or is it pelvic or lower back issues? Doctors from Cambridge University Hospitals wrote in the journal International Orthopaedics (9) that extra-articular hip impingement syndromes encompass a group of conditions that have previously been an unrecognized source of pain. Extra-articular hip impingement syndromes mean problems caused from outside of the hip joint itself as opposed to intra-articular hip impingement syndromes which come from within the hip itself. Where it was once thought that hip impingement was caused by bone abnormalities limited to the ball and socket portion of the hip joint, doctors, including the Cambridge report cited below are finding that hip impingement can be caused by the pelvic bones as well. Ischiofemoral impingement: quadratus femoris muscle becomes compressed between the lesser trochanter portion of the thigh bone and the ischial tuberosity (the sit bones of the lower pelvis). We cover this problem in our article: Ischial tuberosity pain and ischiofemoral impingement: Here we describe Ischial tuberosity pain and ischiofemoral impingement. The focus will be on two types of problems. Impingement caused by instability and non or malunion of the fragment of the Ischial tuberosity caused by apophyseal (growth plate) avulsion fractures in young athletes. Subspine impingement: anatomical problems of the anterior inferior iliac spine (the wing of the upper iliac/pelvic bones) and the distal anterior femoral neck (the neck of the thigh bone) causing soft tissue entrapment of muscle and tendon. Iliopsoas impingement: friction between the iliopsoas muscle and the hip labrum, resulting in hip labrum breakdown. We cover issues in this article of the iliopsoas or psoas muscle as a cause of difficult to treat groin pain. Also, see our article on surgery for hip labral tear. Deep gluteal syndrome: pain occurs in the buttock due to the entrapment of the sciatic nerve in the deep gluteal space. In our articles, we cover a lot of information on the buttock pain and the pelvis, lower spine connection. See also the connection with Hamstring injuries. Pectineofoveal impingement: pain occurs when the medial synovial fold impinges against overlying soft tissue, primarily the zona orbicularis (the hip hip annular ligament). The researchers concluded with a message to doctors that extra-articular hip impingement syndromes should be taken into consideration and should form a part of the differential diagnoses alongside intra-articular pathology including femoro-acetabular impingement particularly in the younger patient with a non-arthritic hip. Doctors are noting that one of the main causes of Femoroacetabular impingement is hip arthroscopic surgery. New research on Femoroacetabular impingement surgery is concerning. Doctors are noting that one of the main causes of Femoroacetabular impingement is hip arthroscopic surgery. Clearly a connection to the MRI research mentioned earlier. In June 2017, researchers in Denmark, as part of the Danish Hip Arthroscopy Registry study and publishing in the medical journal of the International Society of Orthopaedic Surgery and Traumatology (14) questioned how cartilage degeneration is treated in patients undergoing Femoroacetabular Impingement surgery. The majority of patients with femoroacetabular impingement undergoing hip arthroscopy have significant cartilage changes at the time of surgery primarily at the acetabulum and to a lesser degree at the femoral head. During femoroacetabular impingement surgery the majority of patients have cartilage debridement performed but rarely cartilage repair. The presence of severe cartilage injury at the time of arthroscopic femoroacetabular impingement surgery results in reduced subjective outcome and hip function. Several recent reports of revision hip arthroscopy for treatment of residual FAI have exposed potential shortcomings of arthroscopic treatment of FAI, specific limitations with hip arthroscopy’s ability to address large or complex cam and pincer deformities. While hip arthroscopy can certainly be useful for treatment of FAI in some patients, we have yet to identify which patients truly benefit from this minimally invasive approach and those who are better served by open surgical techniques. Italian researchers reporting in the World Journal of Clinical Cases say Femoroacetabular impingement has been reported in as few as 12% to as high as 94% of patients with sports hernias, athletic pubalgia or adductor-related groin pain. Cam-type impingement is proposed to lead to increased symphyseal motion (resulting in cartilage deterioration) with overload on the surrounding extra-articular structures and muscle, which can result in the development of sports hernia and athletic pubalgia. In simpler terms, hip/pelvic instability. In this paper, the researchers are suggesting that for patients with FAI and sports hernia, the surgical management of both problems is more effective than sports pubalgia surgery or hip arthroscopy alone (89% vs 33% of cases). 37 hips (mean patient age, 25 years) were diagnosed with both symptomatic athletic pubalgia and symptomatic intra-articular hip joint pathology. There were 8 professional athletes, 15 collegiate athletes, 5 elite high school athletes, and 9 competitive club athletes. Outcomes included an evaluation regarding return to sports and various scoring systems to determine successful treatment. Thirty-one hips underwent thirty-five athletic pubalgia surgeries. Hip arthroscopy was performed in 32 hips (30 cases of femoroacetabular impingement treatment, 1 traumatic labral tear, and 1 borderline dysplasia). Of 16 hips that had athletic pubalgia surgery as the index procedure, 4 (25%) returned to sports without limitations, and 11 (69%) subsequently had hip arthroscopy at a mean of 20 months after pubalgia surgery. Of 8 hips managed initially with hip arthroscopy alone, 4 (50%) returned to sports without limitations, and 3 (43%) had subsequent pubalgia surgery at a mean of 6 months after hip arthroscopy. Thirteen hips had athletic pubalgia surgery and hip arthroscopy in one setting. Concurrent or eventual surgical treatment of both disorders led to improved postoperative outcomes scores sporting activity in 89% of hips (24 of 27). In the medical journal Arthroscopy (18) , doctors at the University of Rochester looked to see if femoroacetabular impingement is associated with hip instability and in what way. One thing they found was that patients suffered from frank dislocations and posterior subluxation events, the patients’ hips were frequently popping out of place. What does this mean? 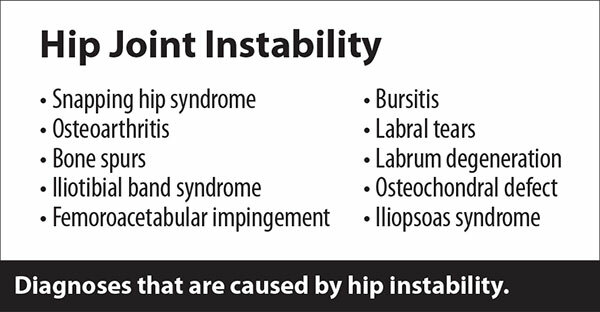 It means that hip instability proceeded the need for the bone spurs. The hip was unstable. In the above research, we discussed a tightening or strengthening of the hips and tendons of the hip to make physical therapy more effective in femoroacetabular impingement treatments. Ligaments and tendons are among the soft connective tissue that hold joints in their anatomically correct shape and help the muscles and bones provide locomotion and range of motion. Ligaments hold bones to bones and tendons hold muscle to the bones. What we have documented through this research is that to treat femoroacetabular impingement you need to treat the whole hip with the goal of regenerating soft tissue to add strength and stability to the joint. 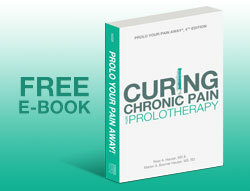 Enter Prolotherapy. In the video above you will see a comprehensive Prolotherapy injection treatment for a runner with hip issues. 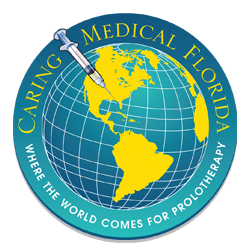 Simply Prolotherapy is the injection of simple dextrose (sugar) into the joint to create a positive inflammatory healing response which will bring the body’s natural growth factors to the area. The simple goal of this simple treatment is to regenerate ligaments, tendons, and cartilage. 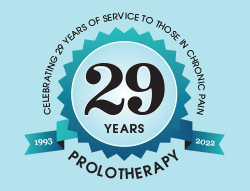 In our numerous research papers on the problems of the hip and treatment with Prolotherapy we suggested better results in patients with some reasonable range of motion remaining, ie 50% or greater normal range of motion, then Prolotherapy works at helping with the pain and exercises like cycling and swimming will slowly allow the patient to regain some of the lost range of motion. Some patients have conditions that predispose them to less range of motion. A person may present with 50% of normal motion in his right hip with regard to external rotation compared to his left hip, but not have any pain in the right hip. He may be able to run and continue sports with no problem, as the range of motion deficiency does not necessarily hinder sports performance or feel painful. In another example, a patient has FAI and his main symptom is groin pain. The patient is a cyclist and is experiencing pain with cycling. In seeing this particular patient, we would try and determine if he truly has FAI on physical examination, looking for a positive impingement sign and then determine the cause of it. If the cause is some tremendous structural problem with the hip like a dysmorphic problem or orientation problem of the femur, then surgical correction may be needed. However the most common cause of FAI and other premature osteoarthritic conditions is simply some type of soft tissue injury such as a ligament injury, so Prolotherapy would be realistically thought of as a better option. Sometimes the patient will only achieve pain relief, which, of course, the patient is excited about. However, some sports like martial arts require not only improved pain levels but also improved range of motion. So sometimes, even though the patient is a good Prolotherapy candidate for decreasing pain levels, the patient may still need arthroscopy or some other surgical procedure to help with range of motion. It is surprising, however, the high number of patients we have seen over the years who do not really get much-improved range of motion with surgical procedures and have supported these observations within the research above.